Avril will be doing a global live stream concert from Los Angeles on December 3 with 2vlive.com. There are no specific details yet, but go here to sign up for email updates. Of course, Lavigne, 29, is anything but a little girl. She’s enjoying married life with Nickelback frontman Chad Kroeger, and today, she released her fifth studio album, a self-titled medley of nostalgic teen anthems, some edgier adult tracks, including one racy collaboration with Marilyn Manson, and a melancholy power ballad duet, “Let Me Go,” with her new husband. The night before her new album dropped, Lavigne chatted with Parade.com about bonding over music with Chad, being shy in an extroverted industry, and her surprising affection for Frank Sinatra. Avril celebrated her CD release last night in New York City and it looks like it was a blast! Even some members of Avril Bandaids got to hang out with her - lucky! Avril Lavigne has a new signature guitar! To add to the 2 Telecasters that have been released over the years, finally, Avril has released an acoustic Newporter! Check out more information about it here. Sounds different without Chad singing! Avril also performed Girlfriend and Sk8er Boi. I will post those videos when I find them. LOL she sure is happy! Can you believe how patient we have been? 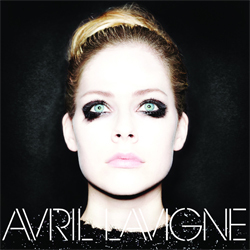 The time is FINALLY here, where everyone around the world can hold Avril Lavigne's new album "AVRIL LAVIGNE" in their hands. Buy the album on iTunes here or at your local record store. Don't forget that those in the USA and Canada can get the exclusive Target edition, which includes "Rock N Roll (Acoustic)" and features a blue cover. It's so important that everyone buys the album in the first week so we can give Avril a STRONG debut! Enjoy, and leave a comment with your favorite song. Scans from Avril and Chad's interview with People magazine about married life, working in the studio and baby plans! Remeber WTH.TV? It's back, now as AvrilTV! Check out the first webisode! There will be a new episode every week with behind the scenes footage.